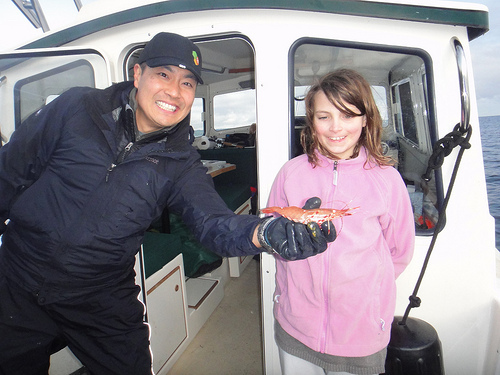 There’s nothing more thrilling than pulling up a pot loaded with prawn-size spot shrimp and what’s guaranteed for the 2019 season is anglers can jot May 11 on their “must go” fishing dates for Puget Sound and Hood Canal. “It will likely be an average spot shrimp season,” said Don Velasquez, a Washington Department of Fish and Wildlife (WDFW) shellfish biologist. Spot shrimp are the largest – averaging 8 to 12 inches long – of more than 80 shrimp species in local marine waterways, but only seven are commonly caught by anglers. Most are lurking at depths of 30 to 300 feet. WDFW set the spot shrimp fishing seasons this past week, and here is a rundown on when you can soak your pots for these prized denizens of the deep. Western Strait of Juan de Fuca (Marine Catch Area 5) will be open daily beginning May 11 and closes once the catch quota is achieved. Eastern Strait of Juan de Fuca (6) will be open Thursdays to Sundays of each week beginning May 11 and closes once the catch quota is achieved. Discovery Bay Shrimp District (6) will be open May 11, 15 and 29 and June 1 from 7 a.m. to 3 p.m. each day. It is unlikely the season will be extended beyond those dates. San Juan Islands in Iceberg Point, Point Colville, Biz Point and Salmon Bank areas (7 South) open May 11-12, May 16-19 and May 23-24. Fishing is allowed one before official sunrise and gear must be pulled before one hour after official sunset. Night-time fishing is not allowed. San Juan Islands in northern Rosario Strait, Bellingham Bay, Sucia and Matia Islands and Strait of Georgia (7 East) open daily May 11-12, May 16-19, May 23-26 and May 30-June 2. San Juan Islands in San Juan Channel, Spieden Channel, Stuart and Waldron Islands (7 West) open Thursdays to Sundays each week beginning May 11 and closes once the catch quota is achieved. East side of Whidbey Island (8-1 and 8-2) open May 11 and May 15 from 7 a.m. to 1 p.m. each day. Northern Puget Sound (9) open May 11 and May 15 from 7 a.m. to 11 a.m. each day. Elliott Bay (10) open May 11 from 7 a.m. to 1 p.m.
Central Puget Sound excluding Elliott Bay (10) open May 11 from 7 a.m. to 11 a.m.
South-central Puget Sound (11) open May 11 from 7 a.m. to 1 p.m. Hood Canal (12) open May 11, 15 and 29 and June from 9 a.m. to 1 p.m. each day. Southern Puget Sound (13) closed for the 2019 season due to low abundance levels. 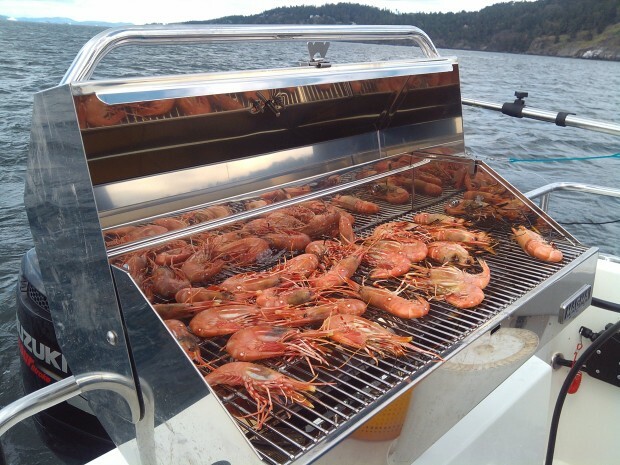 In all Puget Sound areas, the daily limit is 80 spot shrimp per person during the month of May. Additional dates and times will be announced if sufficient quota remains after the initial fishing days scheduled above. Velasquez points out traps can be set one hour before official sunrise during any open period in Marine Catch Areas 4, 5, 6 (except for the Discovery Bay Shrimp District), 7 East, 7 South, and 7 West only. As an example, one hour before sunrise is approximately 4:40 a.m. on May 11. All ocean locations including Marine Catch Areas 4 (west of Bonilla-Tatoosh boundary line), 3, 2 and 1 are open year-round for spot shrimp. 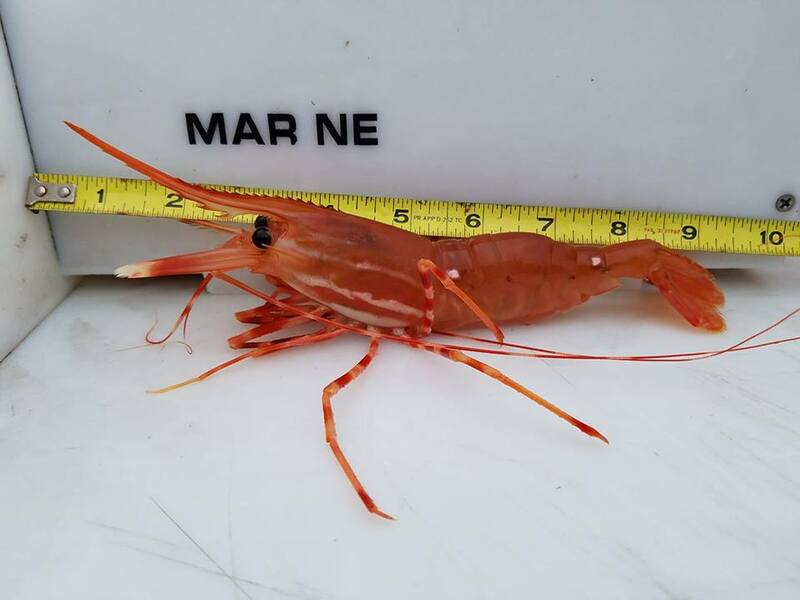 WDFW recently conducted abundance test fishing for spot shrimp and those indicated a mixed bag population of these deep-dwelling, prawns-sized tasty shrimp. Test fisheries were conducted in south-central and southern Puget Sound on March 27 and 28, and Hood Canal had test pots soaking during the week of April 1-5. Testing in the northern section of Hood Canal around Seabeck showed an increase but weak in the central section. “It wasn’t good in terms of the catch (for Areas 11 and 13) and we weren’t expecting much especially in Area 13,” Velasquez said. The test fishery boat dropped pots at three different sites in Area 13 and got no spot shrimp in one location and around one pound in the other two sites. In Area 11 they tried three sites and saw a little over half of what was caught in 2018 and 2017. 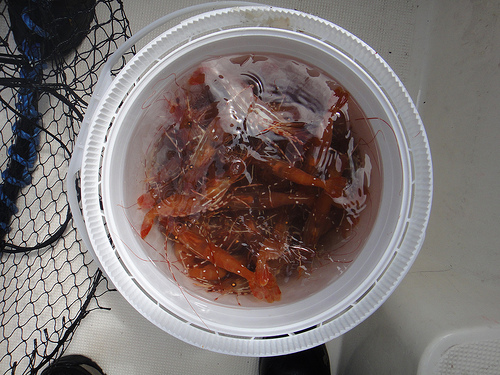 The San Juan Islands used to be a relatively quiet spot shrimp fishery but has grown in popularity over the course of the past several years where bucket-loads of spot shrimp aren’t uncommon. The sport advisory group requested a more predictable fishery in 2019 that lasts until August in Area 7 West, which called for the Monday to Wednesday closure period each week. Last year, the total sport harvest of spot shrimp was 194,863 pounds and the non-tribal commercial take was 97,578 pounds for a total of 292,441 pounds. Sport and non-tribal commercial fishermen split a 300,000-pound spot shrimp yearly catch quota with 70 percent going to the sport fishery. The tribal fishery has a 300,000-pound catch quota. “In general, last year was a fair to good season and while we didn’t get to our 70 percent policy target of the sport-fishery we got pretty close,” Velasquez said. A breakdown of catches from 2018 showed Areas 8-1 and 8-2 had a harvest of 17,970 pounds; Area 9, 5,448; Area 10, 3,571; Elliott Bay, 4,401; Area 7 West, 1,140; Area 7 East, 14,407; Area 6 Central (Hein and Eastern banks and Smith Island), 12,710; Area 6 South (northeast of Port Angeles), 2,000; Area 6 outside of District 1 (north of Protection Island), 4,325; Discovery Bay, 2,441; Area 11, 1841; and Area 13, 318. Marine Areas 8-1 and 8-2 – 256 boats with 865 anglers May 5 fished 896 pots (3.50 pot per boat average) and caught 53,364 spot shrimp for 208.45 shrimp per boat; and 251 boats with 782 anglers May 9 fished 864 pots (3.44 pot per boat average) and caught 48,643 spot shrimp for 193.80 shrimp per boat. Marine Area 9 – 85 boats with 310 anglers May 5 fished 309 pots (3.64 pot per boat average) and caught 21,381 spot shrimp for 251.54 shrimp per boat; and 61 boats with 186 anglers May 9 fished 218 pots (3.57 pot per boat average) and caught 11,409 spot shrimp for 187.03 shrimp per boat. Elliott Bay – 144 boats with 522 anglers May 5 fished 523 pots (3.63 pot per boat average) and caught 33,950 spot shrimp for 235.76 shrimp per boat. Marine Area 10 – 73 boats with 269 anglers May 5 fished 251 pots (3.44 pot per boat average) and caught 16,058 spot shrimp for 219.97 shrimp per boat. Marine Area 11 – 33 boats with 118 anglers May 5 fished 119 pots (3.61 pot per boat average) and caught 4,977 spot shrimp for 150.82 shrimp per boat. Marine Area 13 – 27 boats with 75 anglers May 5 fished 91 pots (3.37 pot per boat average) and caught 830 spot shrimp for 30.74 shrimp per boat; and 16 boats with 41 anglers May 9 fished 48 pots (3.00 pot per boat average) and caught 117 spot shrimp for 7.31 shrimp per boat. Marine Area 6 and 7 – 751 boats with 1,973 anglers May 5-7 fished 2,338 pots (3.11 pot per boat average) and caught 132,964 spot shrimp for 177.05 shrimp per boat.